Chevrolet was on a roll in 1964, selling over 2,100,000 vehicles for the year. The Impala accounted for 689,600 sales all by itself, and the pinnacle of the Impala line up was the sleek and powerful Impala Super Sport. 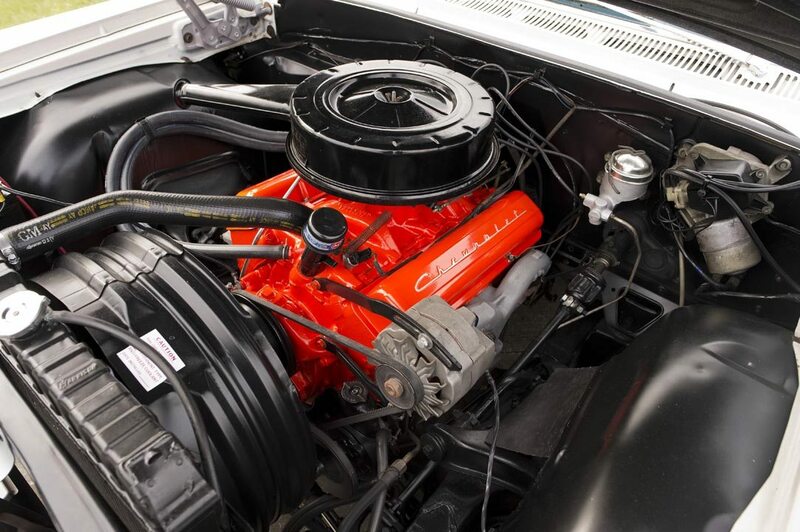 By this time, the SS label had graduated to be a distinct Chevrolet model selling 185,000 units in 1964, as GM began to realize that their sales were being driven by a younger demographic that wanted performance. The SS was just that – big and powerful – and this particular car has the full deluxe trim package with features such as tri-bar SS wheel covers, crossed flag emblems, the now familiar triple tail lights, and that cool engine-turned strip on the rear of the car. 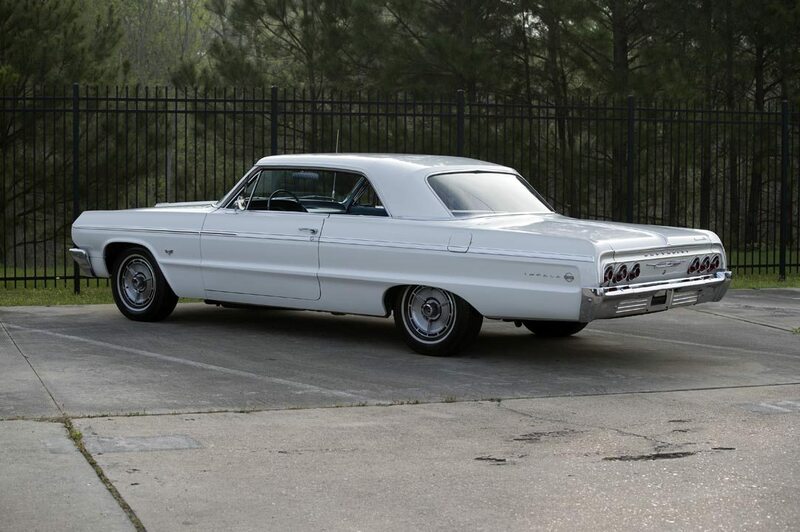 Only the 1964 Super Sports included a wider upper body molding, Impala lettering and SS badging on the rear fenders, and even one on the deck lid. Lots of excellent chrome both front and back round out the deluxe trim package on this beautiful white Super Sport, and all those extras make a real SS like this easy to spot from a distance. The car’s most remarkable feature is the condition of the original white paint that is still looking good on the car 52 years later. Combined with the factory panel gaps and very nice chrome and stainless, the car’s great stance makes it easily mistaken for a restored vehicle. 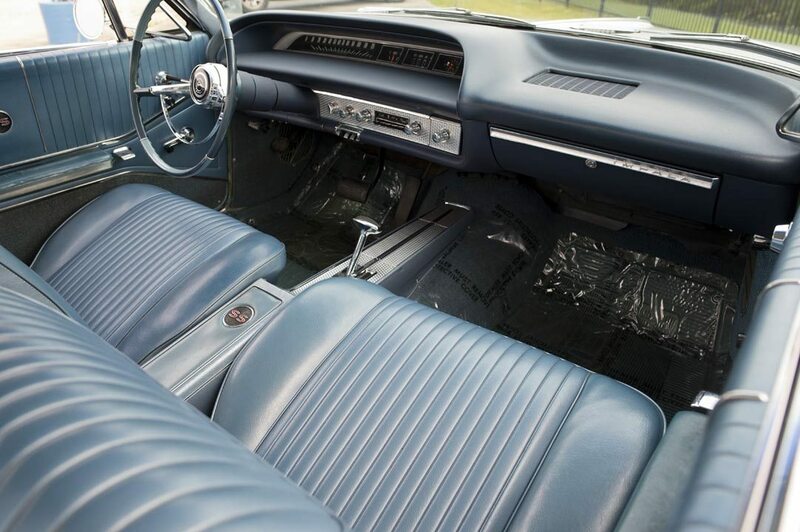 Inside, this Super Sport lives up to it’s name in style, with the original leather-look vinyl bucket seat upholstery in contrasting blue that’s in great condition throughout, and a locking center console behind the floor mounted automatic transmission shifter. The deluxe instrument panel echoes the engine-turned look from the exterior, with the factory Delco AM radio sitting right under a clean and crack-free blue dash. The odometer reads 67,841 miles, which is why the current owner bought it himself – that, and all the documentation that accompanies the car. The owner told us “I was so sick of buying cars that needed everything, that I finally found one that needed nothing but a good detailing. This one stayed in one family for 40-some years”. Take a picture under the hood, and the low mileage becomes evident, because it’s bone stock and very clean. Get on your knees and look underneath – you won’t be disappointed. The 283 V-8 engine looks like it could be straight from the factory, and the entire engine bay presents a clean and correct look throughout. The trunk is spotless, with the original jack and spare in place, and as you look closer, you’ll agree that the car has been polished and freshened but never restored. 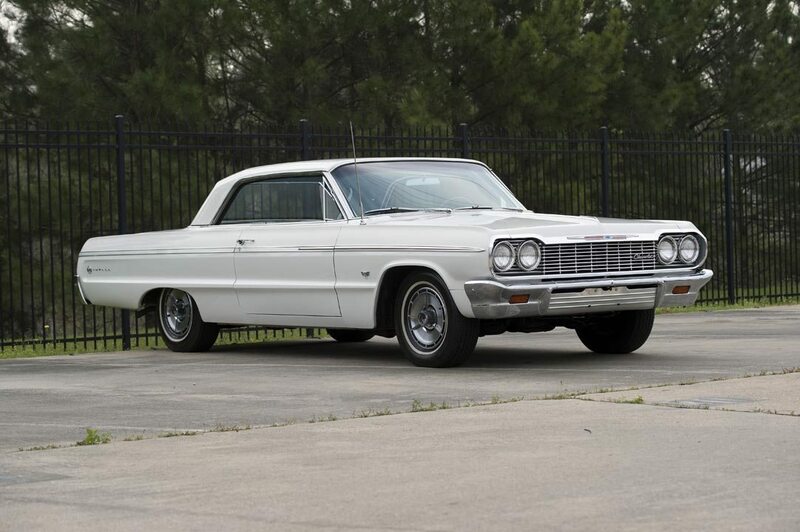 Today, the market has spoken loud and clear in regards to highly original cars that have survived without restoration, meaning this fine 1964 Impala SS should not be taken lightly. For many Chevrolet enthusiasts, 1964 represents the early days of a glorious era for Chevrolet, with features, styling cues, and race-inspired performance that make the Impala SS one of the most desirable cars of the year, and today, GM is considered the leading edge of the muscle car era. Highly prized by many collectors and American car enthusiasts, this 1964 Super Sport is one of the most attractive and hard to find Chevrolets of the 60’s. If you are a fan of bone stock, low mileage cars, take a close look at this fine example we photographed in Houston recently. 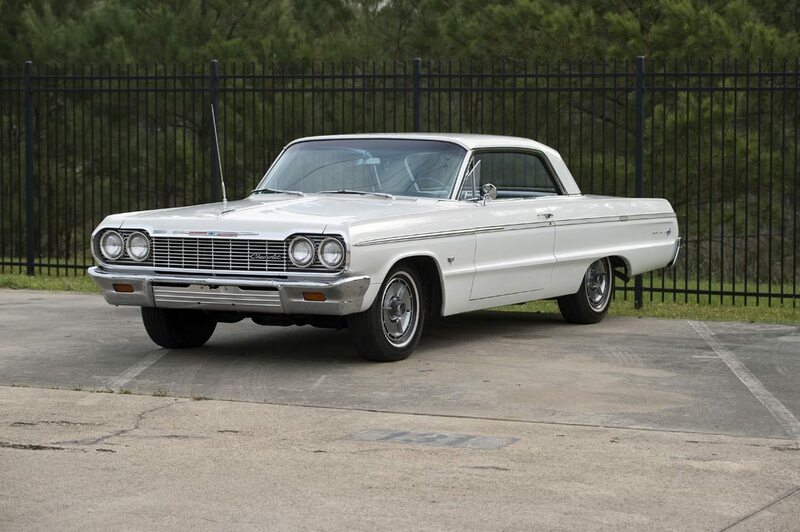 If you have an early model Chevrolet Impala or another collectible you’d like to insure with us, let us show you how we are more than just another collector vehicle insurance company. We want to protect your passion! Click below for an online quote, or give us a call at 800.678.5173.